Chandigarh, India (June 07, 2016): Aiming to redefine the entry-level car segment, Datsun today launched India’s first urban cross Datsun redi-GO, at a starting price of INR 2,40,386. Modern, with zippy performance and stylish design, the Datsun redi-GO will be available in five variants at competitive prices. The Datsun redi-GO showcases a new Japanese design philosophy called YUKAN – which stands for brave and bold. It features ‘Tall-Boy’ styling and offers best-in-class ground clearance of 185 mm, extra roominess and excellent external visibility for the driver. The Datsun redi-GO will be available in five attractive body colour options – White, Silver, Grey, Ruby and Lime. Continuing with the commitment to provide confidence behind the wheel, the new Datsun redi-GO comes with a comprehensive safety package – Datsun PRO-SAFE7. The Datsun PRO-SAFE7 embraces safety solutions like shortest braking distance, high strength body shell to absorb impacts, good visibility and wider view of the road, superior suspension system and excellent maneuverability, high bolster support while cornering, energy absorbing steering and driver airbag. The new Datsun redi-GO delivers superior fuel economy of 25.17 kmpl. The all-new 0.8L three-cylinder i-SAT engine mated to a five-speed manual transmission helps it accelerate from 0-100 km/h in 15.9 seconds. It achieves a top speed of 140 km/h. Its new suspension system allows it to offer a good balance between handling and ride comfort. The Datsun redi-GO comes with an attractive 2 year/unlimited kilometres standard warranty. It also comes with another exciting segment-first – an optional warranty for 2 or 3 years/unlimited kilometres with free roadside assistance. This gives redi-GO owners the option of up to 5 years/unlimited kilometres warranty coverage. The Datsun redi-GO also promises the lowest cost of ownership which is about 32 per cent lower than the competition. Convenience of roadside assistance is provided free of cost with both standard and extended warranties. With its fresh and eye-catching styling, the Datsun redi-GO comes with a host of personalization options. This striking and dynamic line-up offers 50 accessories perfectly developed and aligned with the taste of young and aspirational Datsun redi-GO customers. The five personalized kit options – Urban, Style, Kool, Easy Kit- enhance style and Easy Kit – premium style add a dash of fun and impart head-turning looks to the Datsun redi-GO. 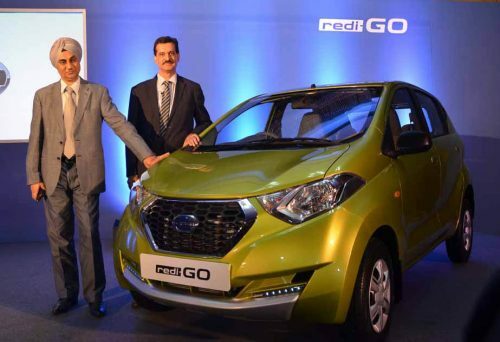 Datsun redi-GO will be supported by 274 Nissan and Datsun sales & service touchpoints in India starting today. With the projected 300 dealerships, Datsun will be able cover up to 90 per cent of current and prospective customers in the country and provide them with easy and immediate access to sales and aftersales services. Datsun redi-GO has already created huge interest among the young and aspirational generation of India. Being India’s first urban cross, Datsun redi-GO’s appeal is reflected in the digital buzz it has created. The innovative ‘Datsun India App’, which was introduced to keep customers updated on the latest news about the car, has been downloaded by over 1.5 lakh users. The App, which has an option to book the car with ease, can be downloaded from the Google Play store.